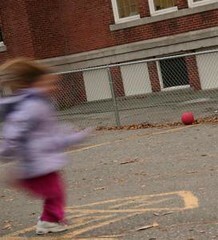 Anyone who still bears psychic scars from childhood games of dodgeball (a game–with distinct Hobbesian overtones in which only the fittest survive–once popular on playgrounds throughout the U.S.) will rejoice to learn that many schools are working actively to introduce children to nonviolent games of cooperation, as articles here and here indicate. Support and inspiration for these kinds of efforts often comes from organizations like Peaceful Playgrounds, whose goals include reducing injuries (over 200,000 children injured annually on playgrounds here in the U.S.), decreasing violence and bullying, and encouraging educational and purposeful play. A conflict resolution component forms part of the overall Peaceful Playgrounds program. Photograph by Adam Sablich, Haverhill, Mass. As the father of two young girls, one of whom is in Kindergarten I am always concerned that she will get hurt while at recess. I have a lot of faith in her school and her teacher but no one can watch every single child 100% of the time. It is nice to see Peaceful Playgrounds offering such healthy and safe alternatives to the more violent and danger prone games many children play or suffer through during their tenure in elementary school. I would love to see this type of thing introduced at my daughter’s school.